What a crazy day! It started with 6am wake up call that I didn’t order, then a ten minute nap before it was time to meet the girls for a grab and go breakfast and get on the buses. Or that was the plan. 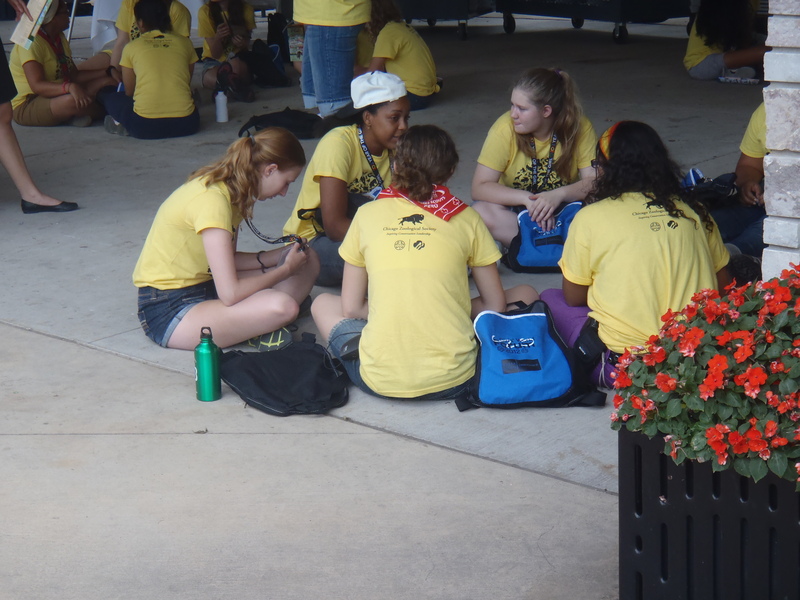 After everyone figured out where they were supposed to be, (chaperones and girls had been told different things the day before) we got our boxed breakfasts and formed a giant line outside. After waiting another 20 minutes (the busses were caught in traffic) out on the sidewalk, we finally boarded and got on the road according to Julia 53 minutes behind schedule. Once we arrived at the zoo, we went straight to the dolphin building. Our bus got in a bit late (but not as late as some others) so we missed the very beginning, but we were talking about conservation. The Brookfield Zoo, like most other zoos around the country, is making a big push for environmental sustainability. They are using their position as an attraction to educate their patrons on ways they can help save the animals they come to see. We walked in in the middle of a speech about aluminum, which they were calling the “most recycleable metal”. They brought up that in Europe you can get a tax credit for recycleing your aluminum car. That made me think about the MI 10 cent refund on aluminum. Almost everyone I know recycles their cans. My roommate and I used to save them up and use the refunds to buy meijer live goldfish and accessories for its tank. Incentives like these are just one of the ways we are learning that governments can help to cultivate change. 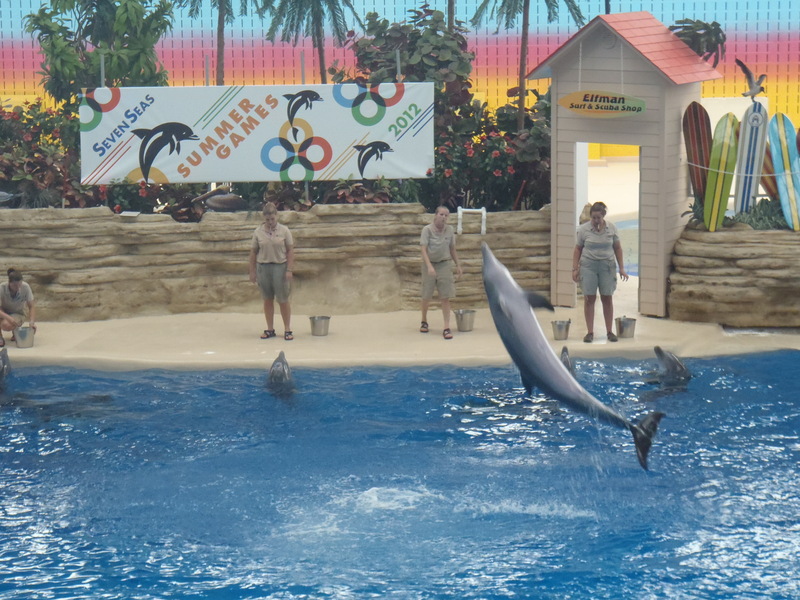 After a few more zoo employees spoke, we got to see the dolphin show. It was awesome, and they showed us some of the behaviors that the teach the dolphins in order for the vets to more easily examine them. Fittingly, the next session we went to was about water conservation. The first activity was I think one that Ali has done before, but it was a good way to put water conservation into perspective. They began with a 2.5 gallon bucket of water. This represented all the water in the world. 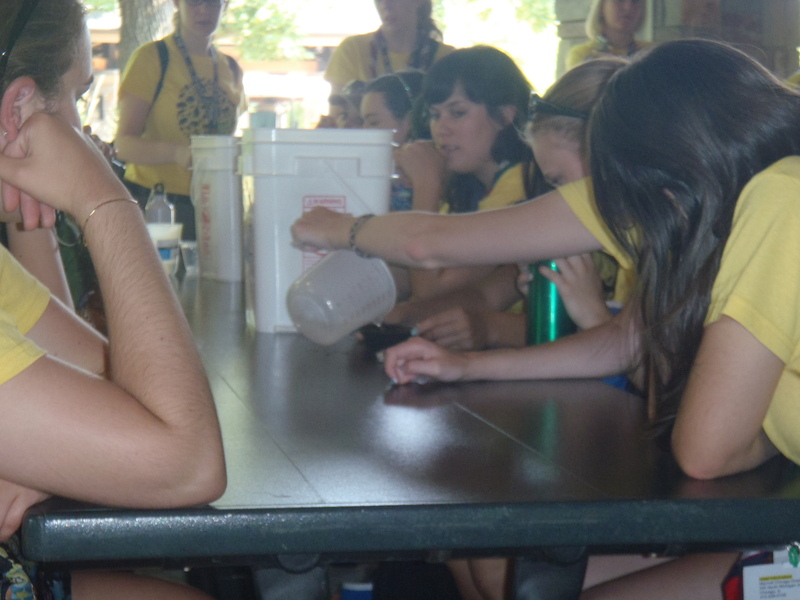 The girls then took out one cup, and this represented all the fresh water in the world. Next, they took out 6 milliliters and this represented all the underground water that most of us drink from. This really showed how precious of a resource water is. Being from Michigan we usually don’t think about this since all we have to do is turn around and there’s a lake, but again, that’s another advantage of being here with people from so many other places who can tell their own stories about water shortages. One of the zoo employees works with MyWaterFootprint.org, a place where you can find out about how much water you use, and what you can do to reduce it. She did a short presentation for the girls, so they can add it to the list of their resources if they choose to do their Take Action Project around MDG 7: Together we can save the planet. 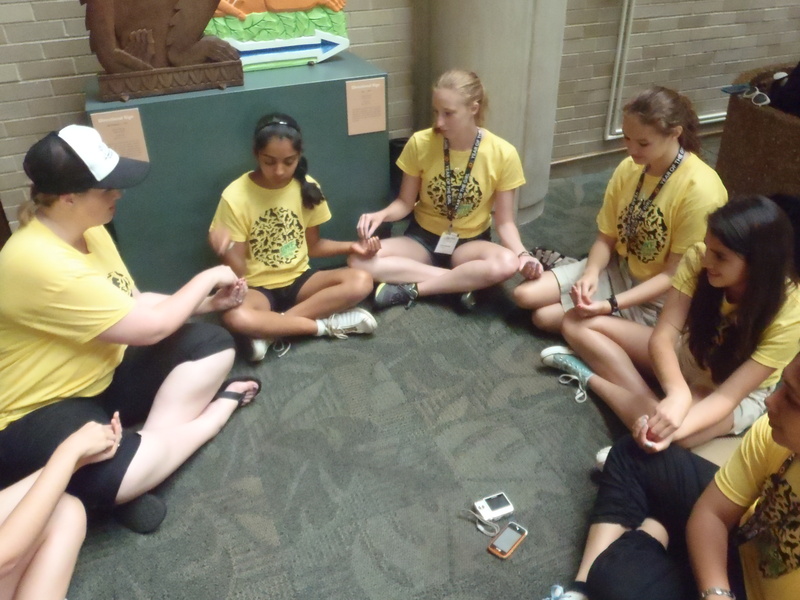 The next session, in the air conditioned Discovery Center, was also good for resources. A representative from Little Brownie Bakers, one of the two bakeries that makes Girl Scout Cookies, talked about palm oil. I know a little bit about this because there were two girls from Ann Arbor, Michigan who really pushed to get sustainable palm oil into our Girl Scout Cookies, an amazing example of taking a stand and advocating. The next presentation centered around big cats and their habitats. We learned about the Forest Stewardship Council, an organization that, among other things, certifies different paper products that use wood from sustainable sources. Again, these are great resources for the girls to collect and research the ones that apply to their projects or interests. After lunch (we couldn’t find the FSC logo on the paper plates, but they were recyclable! ), we had what everyone had been waiting for…free time! 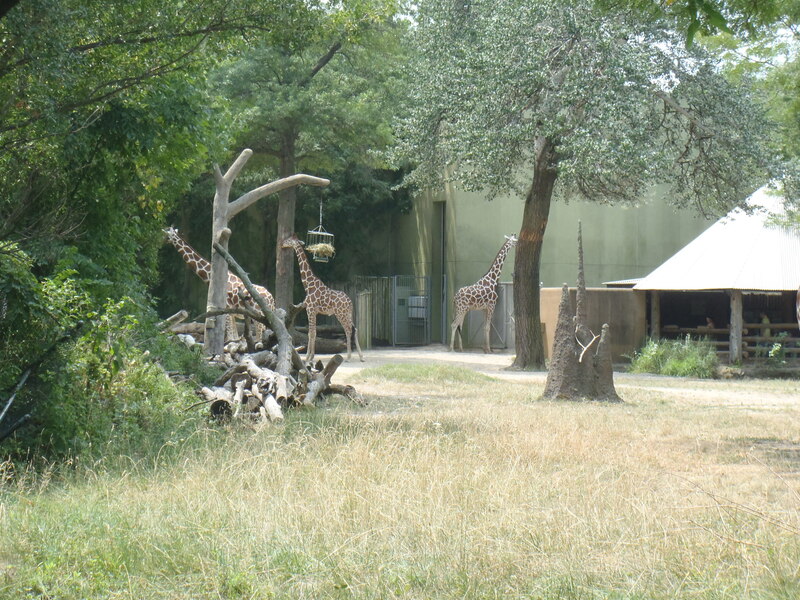 I took around a group of eight girls (I almost made them walk in a buddy line, but decided against it), and we went to see the giraffes. 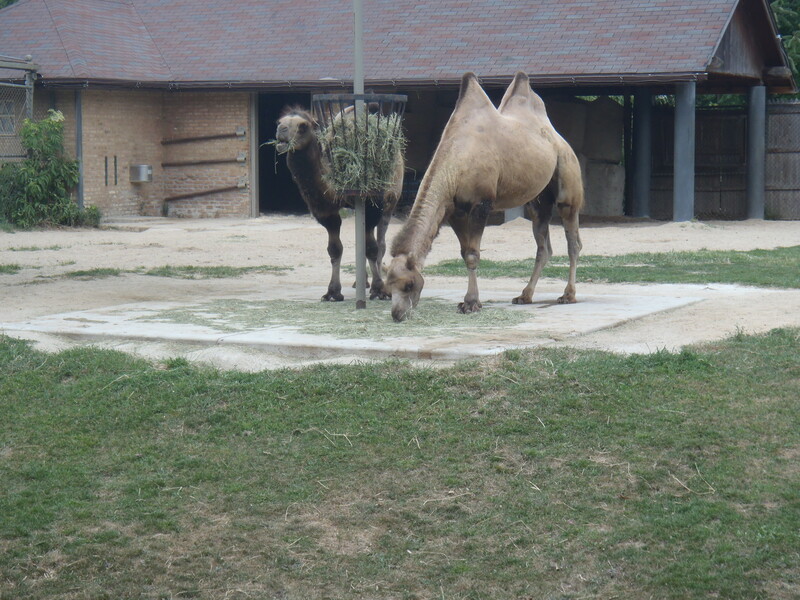 We also saw the aardvark, but it was really hard to take a picture of, and these camels, but we couldn’t ride them like you can at Potter Park. Fortunately the girls were better at reading maps than I was, so we made it back in time for our next session on climate change. To be honest with you, at this point I was watching the sky turn to grey and chatting with some other chaperones, so I’m not positive what exactly was discussed, but they did talk about the ozone layer, the greenhouse effect, and rising worldwide temperatures. Then, something amazing happened. It started to rain. Join me again tomorrow for the conclusion of this zoo story, and hopefully the beginning of another. This forum has given me so many stories to tell, and so little time to share them with you. It is currently past midnight, and I’m very excited for my sessions tomorrow so I should probably go to bed. I’m sorry I’m not caught up yet, but believe me it will be worth it to stick around, I still have to tell you about a sing-along with the closest thing to a rock star that Girl Scouts has, and international night. Want to hear more about something? Less about something? Please comment (up top by the date) and let me know what you like!